Recent historical accounts have credited Bayard Rustin (Hon. Yale Ph.D 1984) with crafting the pacifist strategy of the modern Civil Rights Movement (1954-1965.) Acknowledgement of Rustin’s essential role in this American Movement has, in turn, reinforced Rustin’s reputation in international circles committed to human rights. In addition to organizing the March on Washington, Rustin introduced Martin Luther King, Jr., to Ghandian nonviolence and is credited with inspiring King’s decision to critique economic inequality as well as racial discrimination. Rustin’s life and accomplishments are little known to the American public, however. Historians now seem to agree that Rustin’s story has stayed relatively obscure because he was gay. Although Rustin never concealed his sexual orientation, other leaders of the Civil rights Movement concealed his membership in the most elite circles of the Movement, because the leadership did not support homosexual rights (an idea that began to take shape during the 1920s, in the United States, on the margins of U.S. social thought). Many Civil Rights leaders, in fact, disapproved of homosexuality on legal, moral, religious or personal grounds. In addition, some leaders of the Civil Rights Movement believed that Rustin’s homosexuality posed a security risk by drawing added attention from the FBI, which already monitored the behavior of the Movement’s participants at every level of their involvement in its activities. 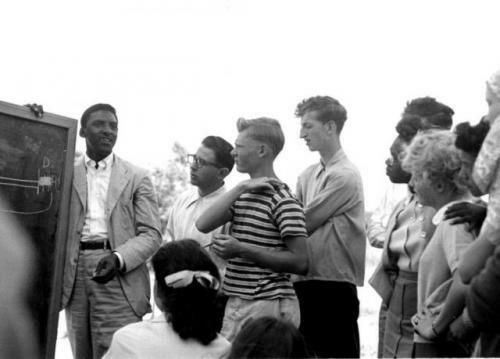 During the fall of 2012, the Lillian Goldman Law Library and several Yale Law School student organizations will celebrate the Centennial of Bayard Rustin. The celebration will take place online and through hardcopy exhibits, as well as with events inside the Law School and at non-law Yale campus sites. The following photographs and reproduced documents (just a few of those that will be included in the library exhibits) give a sense of Rustin’s life and work.